Low Carb Cole Slaw—just in time for grilling season. We had this last night with grilled pork chops and strawberries and dip. My hubby loved it! Cabbage is one of those foods that I never dreamed I would be buying almost weekly! I use it chopped and sprinkled in layers that would potentially have had pasta. I use it for Egg Roll Skillet (recipe coming soon), also known as egg roll in a bowl in many circles, and I use it without the meat at all in stir fried cabbage (sort of Egg Roll Skillet with no sausage). Gone are the days of smelly boiled cabbage that nobody would eat. Cabbage is now cool! 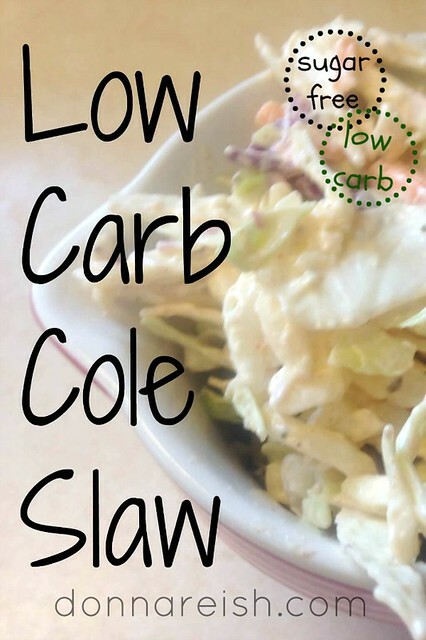 And so today, I bring you Low Carb Cole Slaw. This recipe actually began as a sugar-laden, high-carb KFC Cole Slaw knock off. I can’t attest to its tasting like KFC cole slaw now because we haven’t had much KFC, but I do know that my guys liked it a lot—and with the All Purpose Seasoning Mix, it is super easy! Combine all ingredients together. Refrigerate. Below are links to the ingredients I use in the recipe above. I am an affiliate for Amazon.com. If you click on the links below I will earn a small commission. Thank you for your support of this blog! Low Carb (LC): This is a very low carb recipe if made with the no-carb bulk sweeteners suggested and by using your normal low carb “milk” subs. I used half and half. Very low carb folks might want to use cream. Others might want to use almond milk or other non-dairy milk substitute in order to keep the carbs low. Family-Friendly Low Carb (FFLC): With half and half, regular mayo, and sugar-free bulk sweetener (I used Splenda), my family loved this. If you don’t mind adding a few carbs, you could use whole milk and low fat mayo. This version would probably not be low enough for an under-forty grams low carb diet, depending on how much you eat, but would definitely work for FFLC. Store-Bought-Stella (SBS): If you want to save money, you could use Splenda rather than one of the other more expensive bulk sweeteners suggested. I’m all about simplicity where possible (while still cooking and baking low carb and homemade), so I used the bagged slaw mix—a great SBS tip in general for veggies if your budget allows them. Homemade Hannah (HH): Of course, this could be made more homemade if you do your own mayo and buy cabbage and carrots whole and shred them. Freezer Cooking (FC): Don’t freeze this—or fresh salads in general (except for some fruit salads). Trim Healthy Mama-Friendly (THM) (www.trimhealthymama.com): This can definitely work in an S setting very well with grilled meats and more! I would think you would be a little challenged to get it low enough in fat to use in an E setting—maybe use fat free mayo (is that allowed?) and almond milk or skim milk (?). Just some thoughts. Sugar Free (SF): Sugar-free and healthy sweetener options! See ideas for sugar-free sweeteners here! Gluten Free (GF): No reason to add gluten to this. Use my All Purpose Seasoning Mix, and you’ll be covered! Low Carb Mixes (LCM): This recipe uses my All Purpose Seasoning Mix, a combination of amazing spices that is a great seasoning for meats, veggies, fish, salads, and more!